In earlier published reports, I had warned, in one way or another, that the Roman empire, which is represented presently by the terminal conditions of the hyper-inflated British empire, has reached the fag end of its tyrannies, in one manner or another. In earlier published reports, I had warned, in one way or another, that the Roman empire, which is represented presently by the terminal conditions of the hyper-inflated British empire, has reached the fag end of its tyrannies, in one manner or another. Either the British empire will be shut down soon, or the entire planet were presently at the brink of its collapse into a prolonged, global nightmare, a new “Dark Age” far worse than that which Europe experienced during the 14th Century. However, it were true, hypothetically, that the United Kingdom itself could survive this threat, and the world at large, too; but, that could occur only if the United Kingdom were induced to abandon what Rosa Luxemburg1, and also the U.S. State Department’s historian Herbert Feis2, had identified correctly as the systemic form of what, in fact, was the British empire as such. I supplement Feis’s studies with the fact that the British empire is still, at this moment, an empire which is, in fact, the current expression of that imperialism which was originally that of the monetarist form of empire launched by the then future Caesar Augustus on the Isle of Capri. The original Roman empire passed through a succession of crises, sometimes as the Roman Empire by name, sometimes as Byzantium, sometimes as the system of Nietzschean-like “creative destruction” under the old Venetian monetarist system, sometimes as that New Venetian system led by Paolo Sarpi, which became known as the Anglo-Dutch imperialist system, and, now, since the assassination of U.S. President John F. Kennedy and the U.S. folly of a long Indo-China war, the presently crashing world empire associated with that so-called “BRIC” based on Lord Jacob Rothschild’s folly known as the presently crashing Inter-Alpha Group. Unless that hopelessly bankrupt Inter-Alpha Group is mercifully buried, preemptively, now, the planet as a whole will be plunged into the doom represented by an end of all successive phases of the existence of the Roman Empire, from its founding on the Isle of Capri, to the present days. The only efficient way to explain the process at work, is to identify the principle which was presented, from the top down, in the crafting of the great principle on which the Preamble of the original U.S. Federal Constitution is premised to the present day. That is the same principle which is better known today as the Glass-Steagall principle—known as a name, but rarely, competently understood. I explain. There has been, recently, a foolish tradition in the writing of history, and I am referring here, chiefly to the history of the trans-Atlantic world preceding and during the history of the Mediterranean region, up through the present time. It is a tradition of viewing such phenomena as persons, generations, and even entire national cultures, each as discrete objects interacting, as if kinematically, among themselves, rather than, properly, as a continuing process of cosmic-like development, within which singularities appear as products of the continuing interactions within the trans-generational processes which are any real historical process. Thus, to illustrate the just-stated point, consider the deep roots of all globally extended European history, with regard for its influence on the planet more widely, as this is traceable from the ironies of what are identified as Classical Greek roots, from the Homeric accounts onward. Macedon’s Prince Philip, whose own folly had set him up to be killed, thus left the throne in the hand of Philip’s son and adversary, Alexander the Great. In the end of all that, Aristotle, the poisoner, triumphed in the death of Alexander. Thus, the attempt at an empire of the maritime power of the Mediterranean would wait until the completion of the negotiations, conducted on the Isle of Capri, between that tyrant Octavian who was the murderer of the Cicero who had been the only real hero for Shakespeare’s Julius Caesar tragedy, between the Octavian actually known as the then future Caesar Augustus, and the priests of the cult of Mithra. As with the Roman Empire, which collapsed in the 5th Century, today’s hyperinflated British Empire has reached the fag end of its tyrannies. 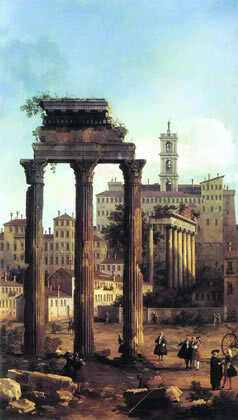 Either it will soon disappear, or the entire planet will sink into a prolonged, global nightmare, a new “Dark Age.” Shown: “Rome: Ruins of the Forum, Looking towards the Capitol,” by Canaletto, 1742. In such a manner, the Roman Empire emerged as an imperial maritime form of world empire centered, originally, on the Mediterranean, which it became, and has remained of late, as the British Empire, since the day William of Orange had invaded, and largely raped the British Isles, all done under the invader’s flag of Paolo Sarpi’s “New Venetian” empire, thus initiating what became the British Empire as the world’s reigning monetarist power, still today. The outcome of that set of pages of the world history of modern, trans-Atlantic civilization, is that the entire world is, presently, gripped systemically, by the presently continuing conflict between two leading cultures, the monetarist culture of a Europe presently dominated by the tyranny of the British Empire, versus the culture of a credit-system founded in North America over the interval from the establishment of the Massachusetts Bay Colony under the leadership of the Winthrops and Mathers. It was the consequent, later founding of the United States as a constitutional republic, as defined by the Preamble of its Federal Constitution, which was echoed by the miraculous resuscitation of that great republic under such exemplary Presidents as Abraham Lincoln, and in President Franklin Delano Roosevelt’s crucial role in launching of the Glass-Steagall Law. Presently, unless that 1933 Glass-Steagall Law were immediately re-established, now, the continued existence of the United States were soon ended in a bloody, hyper-inflationary collapse now nearing its end. There is no action by the U.S. President and U.S. Congress which is “worth a hill of beans,” unless the re-enactment and enforcement of that Glass-Steagall Law occurs as a foremost priority now. The problem is, that unless this current U.S. President were ejected, as might be done under the relevant provisions of Section 4 of the U.S. 25th Amendment to the Constitution, the continued existence of the United States is not possible by any known, lawful means under its own law. There is, therefore, no other morally tolerable commitment by the institutions of our Federal government, than the two-fold measure of immediately re-enacting the 1933 Glass-Steagall Law, and ending the power of the current President to prevent the prompt and efficient re-installation of that 1933 Glass-Steagall law. Abandon all silly chatter about worthless hopes for rescue by a general U.S. election approximately two years ahead; under present trends, a new election under our Constitution would probably never occur. Without Glass-Steagall, the United States will soon cease to exist in any presently recognizable form, if it exists in any form at all, even past the relatively few months now immediately ahead. A state of global, hyper-inflationary collapse, is already built into the trans-Atlantic system. The count-down to doom is already on, unless we replace Obama now. Without the type of reform which I prescribe here, the trans-Atlantic economy and its nations are already as much as foredoomed to rot; I present the summary proof of that fact within these pages. Whereas Asia’s problems are not hopeless in themselves, but tend toward a contrary, and, therefore, happier direction, a collapse of several leading economies of Asia, which would occur as an echo of any collapse of the trans-Atlantic system, would carry all of Asia down with it. You can blame Lord Jacob Rothschild’s system, which he installed, circa 1971 as part of the treasonous intention of the London-directed U.S.A.’s abandoning of the Bretton Woods System, an implicitly treasonous, August 1971 change, introduced as an alternative to the U.S.A.’s fixed-exchange-rate system which had been established by President Franklin Roosevelt’s triumph over John Maynard Keynes at Bretton Woods. A presently inevitable, already ongoing collapse of the Inter-Alpha system and its auxiliaries, would presently bring down the entire world economic system, chain-reaction style. Without immediate re-enactment of President Franklin Roosevelt’s Glass-Steagall action of 1933, the planet as a whole were soon plunged into the deepest, widest, and longest dark age in historic times. Thus, the doom of the British stage of the Roman empire lies, now, not in the hands of its present adversaries, but, finally, in no other foe as much as itself. The ancient, and continuing root of the combination of already existing or immediately threatened, global disaster, lies, essentially, in the concept of monetarism itself, in the delusory obscenity of the belief that money as such represents a rational standard of “economic value.” Hence, for as long as the nations are intoxicated by belief in the folly of monetarists’ systems, the present situation of the nations of the planet as a whole, even any form of belief prevalent as the ruling sentiment of the most influential laws of mankind as a whole, were presently a hopeless case. Therefore, I summarize the truthful scientific principle of economy in those terms of historical and physical-scientific reference, here, as follows. I. What Is the British Empire? The British empire, which has never been understood by more than a handful of modern economists, such as Rosa Luxemburg and the U.S. State Department historian and scholar Herbert Feis, has now entered what will soon turn out to have become the last gasp of its existence, that in one way or another. Either the British empire, a maritime empire, is soon wiped from the map, or, in the alternative, the effort to maintain the existence of that inherently failed empire will send the entirety of the planet to Hell for a long time to come. The effect of the resumed influence of the British empire over the policies of the United States, has progressively ruined us since the death of President Franklin Roosevelt, especially since the successful assassination of a President John F. Kennedy which broke President Kennedy’s and General Douglas MacArthur’s resistance to entering the British trap for the United States which the British empire had crafted in Indo-China. The Kennedy assassination, thus, unleashed ten years of physical and moral ruin of the institutions and people of the United States from which our republic has not yet returned, still today. 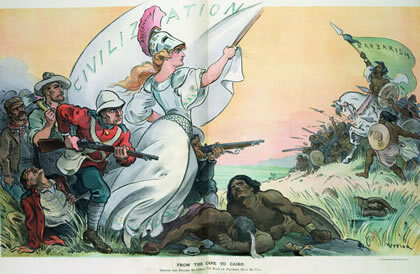 Such a maritime form of empire as that which the British empire exerts over Europe today, is the expression of an international dictatorship imposed upon a collection of otherwise, ostensibly separate nations, exactly as the “Post-Westphalian” policy of the present, so-called “Post-Westphalian,” “Euro” system prescribes today. The quality of the Roman empire and its relevant sequels, as expressed by the British empire today, has two most essential characteristics, as follows. The first characteristic of that empire, is that of an imperial “personality” with the power to decree a body of international law, presently termed “governance,” imposed upon all subject “kingdoms.” It is a power which lies in the personal authority of the Emperor, such as, nominally the British monarchy, as the body which functions as the de jure person of the emperor to equivalent effect. Such is the presently attempted form of the British empire’s tyranny against the nations of continental Europe, since the imposition of the “Euro” system of monetarist imperialism by the concerted action against Germany by Britain’s Margaret Thatcher, France’s President François Mitterrand, and U.S. President George H.W. Bush, in 1990 and beyond. Similarly, earlier, the intended design of Adolf Hitler’s imperial form of Reich, had been a system of a form inhering in the British intention for the Euro system today. Such was the kindred import of the implicitly treasonous “signing statements” uttered against the Federal Constitution of the United States itself, under U.S. Presidents George W. Bush, Jr. and Barack Obama. Second, all empires of that sort, are contained within a monetarist system which operates, through international institutions, as an imperial authority, as the design of the Euro system, essentially by the British crown, prescribes this condition for the “governance” of its victims, its subjects, presently. Such systems are typified by examples such as the original Roman Empire, by Byzantium, by the extended Norman system under the direction of Venetian monetarism, by Sarpi’s pre-shaping of the so-called “Liberalism” of the British empire, and by the expanded British Empire which dominates, and loots the Euro system presently. For deeper insight into the Europe-based forms of such imperial tyrannies, one must examine the root of this system in the role of the Delphi cult in its time. The affirmation of “the oligarchical principle” by agreement between Macedon’s King Philip and the Achaemenid empire, illustrates the point. Aristotle, like, later, that high priest of Delphi from the Roman empire’s reign, Plutarch, remains a notable, ancient exponent of that oligarchical system of evil presently. In general, since the establishment of the Roman Empire, with relatively rarer, and relatively short-term exceptions, the European system has been a collection of “kingdoms” under the imperial rule of a trans-national, monetarist system. That has been the issue of the essential distinction of the constitutional system of the U.S.A. from the long trend in European systems thus far. The great struggle of all humanity presently, is a struggle of nation-states to secure their freedom from the looting practices of a presently dying world system, that of the British monetarist empire in its present form. Since that empire is systemically a monetarist system, the comprehension of the great existential struggle for a return to a system of freedom, depends upon the enforcement of a global, fixed-exchange-rate system modeled on the great fundamental principle of constitutional law expressed as the Preamble of the U.S.A. Federal Constitution. From the outset of the preparation and installation of that Federal Constitution based on that great principle of its Preamble, our republic has been premised on the same notion of a credit-system, rather than a monetarist system, a credit-system which was pioneered under the sovereignty assured by the original Royal Charter of the Massachusetts Bay Colony and the colony’s Pine Tree Shilling-based credit-system. Under that tradition, and the Constitution created to establish that principle as a sovereign nation-state system, our United States had been the only durable expression of a truly sovereign nation-state within a world over which the Roman empire in its British incarnation had reigned, with few and brief exceptions, since the devastation wrought by the French Revolution and its recurring victimization by the British Empire which had been implicitly established in the February 1763 Peace of Paris. All major warfare on this planet since that 1763 Peace of Paris, has been the expression of an imperial practice of attempted dictatorial management of this entire planet through monetarist practices aided by recurring long wars, including the perpetually recurring state of such ruinously long, intentionally geopolitical wars on this planet as those launched by the British empire through the effects of the British monarchy’s ouster of Germany’s Chancellor Bismarck, in 1890, as, also, recently, under the same British Prime Minister Tony Blair who has revived the criminal health-care policies of the Adolf Hitler regime in the United Kingdom and, now, under the British-appointed puppet-President of our United States, Barack Obama, presently. To regain the constitutional order prescribed in the Federal Constitution of our republic, we must first regain an insight into those great principles of our republic which have suffered infraction against our constitutional principle through acts expressing an imperialist enemy’s hatred of our republic, an enemy who has been determined to destroy the great principle of our republic ever since the time of the 1763 Peace of Paris. The great issue which has been the recurring source of mortal struggles between our patriots and the British monetarist system, as since the time of that 1763 Peace of Paris, has been our republic’s recurring return to the affirmation of the principle of a credit-system, rather than that imperialist system of monetarism, as the monetarist system is expressed for our United States by the implicitly treasonous character of the once Hitler-loving Wall Street of Brown Brothers Harriman, which was the type of a usurious predator which makes slaves of all those who become its victims. Only the affirmation of the principle of a credit-system, rather than a monetarist system, as the original Glass-Steagall Law expresses that U.S. Constitutional principle, could now prevent the entirety of this planet from an early plunge into a global Hell from which civilization would not recover for many generations to come. To this end, the institutions and citizens of our United States must clear the cobwebs of the rabid, pleasure-pain-driven irrationalism of the Paolo Sarpi-Adam Smith liberalism from their minds, to see, and obey that true principle of the credit system which is inherent in the founding of our republic and its Federal Constitution. The most essential of the preconditions for the political freedom which our Federal Constitution was intended to secure for us and our posterity, is the commitment to an increase in the net physical powers of productivity of the means of existence of a growing population of our republic, and, hopefully, a contribution of a kindred quality for other nations as well. On this account, there can be no other definition of wealth than the net increase of the physical wealth produced per capita and per square kilometer of territory of our nation, and, also, our assistance to that same quality of end for the other nations with which our republic must cooperate, that done for common ends, on behalf of the general welfare of humanity as a whole. NASA The continued survival of mankind exists depends upon the vigorous advance of an increase in power, as defined by nuclear fission and thermonuclear fusion. 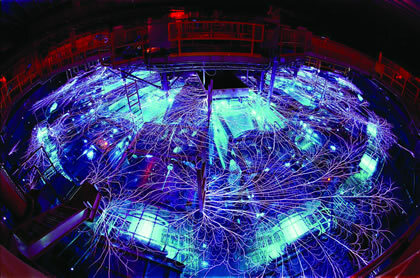 Shown: Sandia National Laboratories’ “Z Machine,” the world’s largest X-ray generator, which, it is hoped, will, one day, ignite a nuclear fusion reaction. It is the nature of the universe, a nature which must be the guidance of all sane nations and their peoples, that our universe demands, as a condition for our survival, that we pursue a vigorously anti-entropic policy of universal practice, as, for the case of “fire,” which only mankind among all living creatures, practices, through a persistent increase in the energy-flux-density in the principal forms of action on which not only the progress, but the very survival of a human culture depends. So, survival of mankind exists, presently, only in a vigorous advance into the increased power to exist of an age defined by nuclear fission and thermonuclear fusion, and beyond, exactly as the history of the emergence of, and progress in life on Earth has always depended, so far, and will depend, increasingly in the decades immediately ahead. The currently onrushing great general economic-breakdown crisis, has been, in a large degree, the increasingly contrary, and increasingly fatal error of belief and practice among our citizens and the institutions of government which is called “monetarism,” “monetary theory,” and such. In short, the conflict between President Franklin Roosevelt and John Maynard Keynes, during the proceedings of the 1944 Bretton Woods conference. The trouble was, that soon after that, President Franklin Roosevelt died, to be succeeded by a Vice-President Harry S Truman who had been a Wall Street Democratic Party crony of fascist-leaning implications, and, also, a bit of a late-comer in recognizing the nature of the evil of those combined British and Wall Street financier interests, such as the head of the Bank of England and his partner, Brown Brothers Harriman, which had, in fact, brought Adolf Hitler to power in Germany. Already, once the Allied forces, led by General Dwight Eisenhower, had effected the successful landing in Normandy, the same old “American Tory” attachment was resumed as the expression of Franklin Roosevelt haters whose loyalties had lain between those British imperialist interests and their Wall Street cronies who, as in the case of Brown Brothers Harriman and its official Prescott Bush, had funded bringing Adolf Hitler into power in Germany. The British intelligence service’s role in the wrecking of the surrender being prepared by relevant German generals, and the seemingly insane Montgomery-led caper of the First Army, successfully postponed the gaining of the Allied victory for virtually another year, during which many Americans in service, and others, died. With the death of President Franklin Roosevelt, and the accession of the Wall Street-friendly Harry S Truman, the cause of our United States suffered a defeat from which we have never fully recovered as a nation, to the present day—despite great Presidents such as the Dwight Eisenhower and the John F. Kennedy who operated under hostile and also, especially for President Kennedy and his brother, implicitly deadly conditions. Thus, the time came, when the assassination of President Kennedy had plunged the United States into the long, foolish war in Indochina, from which our United States has never resumed its true self, to the present day. So, in these and like ways, most among our lawful and other political leaders, have lost a large part of the essential moral and intellectual inclination which was specific to the founding of what was to become our republic in Seventeenth-century Massachusetts, and in the great achievements under our greatest elected and other leaders during sundry periods of the Eighteenth and Nineteenth centuries, as, also, under a President Franklin Roosevelt whose conscience inherited the devotion of an ancestor, Isaac Roosevelt, who had been allied with the designer of our U.S. constitutional economic policy, Treasury Secretary Alexander Hamilton. We had also been led, in a good time, by a President Franklin Roosevelt whose comprehension of our great Constitutional principle is virtually unknown among most of those newly elected members of the U.S. Congress today, who, if allowed, will destroy what remains of our republic, members of the Congress who, today, proceed, in large part, with brutish lack of comprehension of the nature of their own incompetence. How could a man swear an oath to perform a duty of which he has no comprehension? Today, there is presently virtually no comprehension of the actuality of those great principles on which the unique genius of our republic had depended thus far. Without re-educating much of our republic’s political leadership, and citizens alike, by giving them back the great principles understood by those, such as the Winthrops and Mathers, who planted the roots of our great American design, there is little likelihood that either our republic, or any part of the world’s civilization at large, will survive the increasingly terrible months now just ahead. To get down to fundamentals, respecting my numerous achievements as a forecaster, contrary to that of notable other specialists in the field, the difference between my successful method of forecasting and analysis, and their usually failed foresights, has been, essentially, ontological: Their forecasts are premised on a statistical (e.g., phenomenological) standpoint (statistics, the Sarpian, “touchy-feely” Liberalism of Adam Smith), whereas mine are ontological (physical principles). The most publicized example of this difference, is that reflected in my defeat of a leading British economist of the intrinsically pro-fascist tradition of the cult of “creative destruction” of such as Friedrich Nietzsche, Werner Sombart, Joseph Schumpeter, and the likes of Larry Summers: the Professor Abba Lerner whom I defeated in a celebrated New York’s Queens College debate on December 2, 1971. Instead of those prevalent, but essentially incompetent notions of principles of political-economy, we must consider economy as not statistical monetarism, but as being at the core of the principles of a human practice of a physical science. Contrary to the poor fellows who had lately come to occupy precious positions of government and the like, any distinctively competent form of a physical science of economy for today, is essentially a reflection of the current of physical science coherent with two of the greatest scientific geniuses of recent centuries, Bernard Riemann and the Academician V.I. Vernadsky who was no Marxist, but a patriot of Russia who performed his mission of devotion to both Russia and Ukraine, and, to humanity at large, as well. For the purpose of an adequate appreciation of the relevance of Vernadsky’s leading contributions to a less imperfect science of physical economy, still today, we must recognize the crucial role which the work of physicist Bernhard Riemann had contributed in defining the conceptual foundations for all of those most singular achievements which were either contributed by Vernadsky, or expressed a shared world-outlook respecting not only science, but on mankind as such, an outlook, which, despite those statisticians who seem to trace their intellectual ancestry to Jonathan Swift’s floating island of Laputa, permeates still all of the greatest of the surviving achievements of science in the world at large still today. Apart from the fact, that I have been an extraordinarily, even often, uniquely successful physical-economic forecaster since my first such success in 1956-7, all of my own significant contributions to any actually competent notion of a physical science of economy, have been, essentially, a product of the interrelationship between my own knowledge of a physical-economic process as such, and the foundations, in the fundamental contributions of Riemann, for appreciating what I later came to recognize as the indispensable function, for a competent science of economy, of Vernadsky’s rigorous treatment of the respective and interdependent notions of the lithosphere, biosphere, and noösphere. Thus, competent economic science, is physical-economic science, not statistical forecasting. It has nothing to do with the likes of such charlatans as both that pair of dupes of Bertrand Russell, the John von Neumann and Professor Norbert Wiener whom David Hilbert had tossed out of the faculty at Göttingen. More to the point, recently accumulated investigations bearing on the leading role of what is termed a “cosmic radiation” permeating what is never, and nowhere a part of “empty space,” now depend on deeper insight into the conclusive quality and forward-looking implications of the apparent qualitative divisions, and interrelations among the lithosphere, biosphere, and noösphere within the confines of that region which our Solar system inhabits on our galaxy’s periphery. The unique success of Johannes Kepler in defining the Mars and Earth solar orbits in his New Astronomy, and his subsequent, uniquely original discovery of a principle of gravitation, in his Harmonies, point out to us the significance of what Kepler himself defines as a method of “vicarious hypothesis,” a discovery of the ancient Platonic method, and that of Nicholas of Cusa, which assumes its momentous character in the uniqueness of Kepler’s discovery of the principle of gravitation. Hence, Einstein’s genius in insight into the explicit notion of a universe as finite but not bounded. Similarly, for most of that time which we can presently attribute to the existence of manifest forms of life on our planet Earth, the evidence has been, that life had been long expressed, chiefly, in something approximating unicellular forms of animal and vegetable life. Thus, for most of what we consider as relevant fossil resources, known human societies have depended upon the accumulation of the massed dead bodies of unicellular, or comparable forms of life. Such is a fair description of the matter to be considered. The case of iron ores is an illustration. Most of the raw materials on which civilization depends today are found in fossil remains, such as iron deposits, left behind by deceased forms of what had been living processes. Thus, when we gather up and employ “iron ores,” we are depleting the density of the forms of ores left behind by long-deceased expressions of life concentrated in certain environments in this manner. Hence, to overcome the loss of richness of such resources left behind, we must act in ways which have the effect of increasing the equivalent of “the energy-flux density” of the sources of heat-power applied to production for human needs. This pattern of proceeding from raw materials and heat-processes of relatively lower, to higher orders of energy-flux density, has been the basis for every case of a society’s ability to maintain its population’s ability to maintain an improved, or even a constant level of potential relative population density. Only the scientifically insane could believe, today, in the outright fraud of presuming that the degeneration of the productive powers of labor by reliance on such wasteful nonsense as windmills and “solar collectors” is allegedly sane policies of practice. Mankind’s willful progress in the discovery and use of heat-sources of relevant forms of higher degrees of energy-flux density, is the precondition for maintaining a viable form of human culture at a preexisting level. 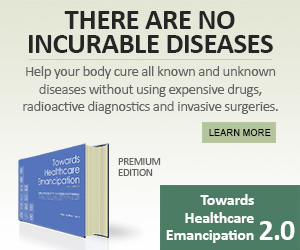 Today, the use of the sources of power such as nuclear fission, and of thermonuclear fusion, have become a growing ration of the indispensable means of rising standards of “energy-flux density” which are, more and more, indispensable for preventing a society’s physical and moral degeneracy through attritional processes. Not only must society rely upon increases in the level of energy-flux densities controlled and employed; mankind must organize the environment by aid of revolutionary transformations of society’s cultures to higher levels of the equivalent of energy-flux density. There is no sane excuse today, for what are the actually mass-homicidal practices of what are called “green” anti-nuclear policies and the like today. For reasons related to such considerations as those, a competent practice of the principles of economy depends upon discarding virtually everything usually taught as “economics” in common practice of economists and related others today. Therefore, we should not find ourselves surprised, to learn that a competent practice of economics as a science, takes us into what is, in fact, the most profound, and least well known of all presently known branches of physical science. The principle of “energy-flux density,” is among the simplest of those often neglected considerations. It is mankind’s tendency to recognize crucial qualities of proof respecting those universal physical principles which are specifically accessible to the development of the processes of the human mind, which defines an implicitly direct relationship between the creative powers innately developable in the human mind and the universe with which that mind is interacting. It is man’s conception of that relationship between ourselves, our cultural progress, as in science, and the universe which man inhabits, which is the basis for anything of truthful value which man can adduce for lowered ontological forms of existence. I have, recently, discarded further use of the term “infrastructure” as a term of professional economics. Instead, I have introduced the term “platforms,” as notions to free me of the popular, but imprecise meaning of the term “environment.” There have been several crucial considerations. LPAC-TV Rather than the term “infrastructure,” LaRouche has introduced the term “platform,” to describe an “upshift” of the Biosphere, produced by the application of the discovery of a universal physical principle. NAWAPA, as conceived by LaRouche and his scientific Basement team, represents such a platform. 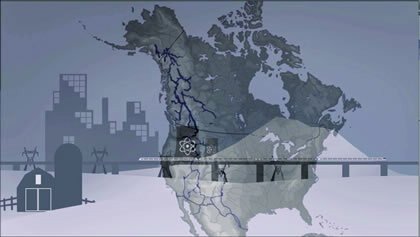 This image is taken from the LPAC-TV video, “NAWAPA, Water for Life” (http://larouchepac.com/node/15570). I shall approach the subject of these platforms, in two, successive ways. First, I shall indicate the terms to be used as definitions of certain, pivotal technical terms used for this purpose. Second, I shall restate the case in terms describing an actually historical process which represents the modern cultural roots of the existence of our United States. The significance of those notions, is that they correspond to the character of space-time relations within both the planet and its particular regions, rather than being typical of the limits of an occurrence of a specific localized action. Therefore, I begin this chapter with the included subject of the transport functions listed in historical, or quasi-historical orderings: water (maritime); water (riparian/rivers integrated with canals—as under Charlemagne); railway systems; high-speed transcontinental railway systems; very-high-speed track (rail or maglev) systems; ultra-high speed systems (e.g. 1000 mph in semi-evacuated tubes); and, extra-terrestrial systems. Next, we have the quality of intellectual cultural level of development of mankind within society considered as an ongoing process. E.g. : “Classical artistic” and “scientific” education of the population generally (as an expression of the intellectual potential which is characteristic of a specific quality of a human population). Putting this in relevant, other terms, this means the general intellectual development of power expressed intellectually by the culture of a nation or comparable society; this points to a general intellectual level of a national or comparable division of culture, as distinguished, as an underlying category of aptitude of a culture, as a notion of potential, as contrasted to the notion of the localized practice specific to some group of individuals within society. The cross-over from the category of what may be treated as simply “platforms” as such, to the development of a society’s potential and individual or local action, is to be located in the application of the discovery of a universal principle, such as a level of quality of practice of a body of physical science, or of Classical artistic composition and its performance. In short, we have the concept of the universal personality of a general population’s productive potential, as one distinguished by the radiation of an efficiently valid discovery of some relatively higher, truly universal principle of physical science, or, equally, of Classical-artistic mode of composition. LPAC-TV The natural evolution of the conditions of life on Earth, is, in significant part, determined by qualitative shifts in the Solar system’s relationship to our Galaxy. 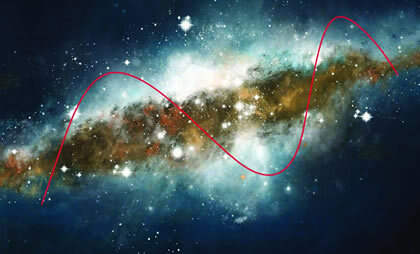 Shown: Our Solar system oscillates above and below the plane of the Milky Way, in a 60-million-year cycle. In other words, we must distinguish between the general level of application of energy-flux density, and extraordinary higher, or lower cases within the same domain. These, and comparable features of the environment on which human life of a certain level of quality depends, are comparable, in their effects, to the climate conditions near the surface of our planet. In the extreme case, these conditions are indispensable choices of feasible approaches both to the maintaining and developing of successively higher orders of organization of human life, within such bounds, this corresponds to the notion of the development of the conditions for not only life as such, but, that the level of productivity achievable is determined in ways aptly illustrated by the available quality of transport of human beings and their productivity. To introduce this subject, let us refer, here, to the case of celebrated statesman Charlemagne’s revolution in economy and culture, through integrating networks of inland transport of persons and freight through integrated networks of rivers and canals. This work effected under the leadership of Charlemagne, was one of the greatest leaps forward in the productive powers of labor presently known in the human species’ European history. For an example from a later phase of European and North American progress, take the still higher “geopolitical” level of trans-continental rail and related transport. “Nuclear Age,” or “Thermonuclear Age,” typify relevant cases of qualitative leaps to higher, physical, “geopolitical” states of organization of society as a whole. To make clearer the significance of replacing the notion of “infrastructure” by “platforms,” consider, once more, the profound changes in conditions for life-forms on this planet as Earth came into an oxygen-dominated phase, and the later shift to an “ozone” phase. We are challenged, presently, by two broad classifications of such phase-spaces. The one by the natural evolution of the conditions of life, as determined by qualitative shifts in the Solar system’s relationship to our galaxy, and, within those bounds, the qualitative shifts in the conditions for life within the bounds of the Solar system, and, within the Solar system, within the conditions for life-forms on Earth. Following that, science must focus attention on those general changes in the potentiality of human habitation and development of our planet, which are willfully man-made principles of the environment in which mankind’s habitation and work within human life and production, are brought to relatively higher stages of productivity, as within the newly created “level” of the potential representation by the environment. You should focus, first, on the strategic quality of logistical forms of “environmental factors” of quality of habitat and of facility of movement throughout the inhabited form of the developed environment. To serve the purposes of this present phase of the discussion here and now, compare societies which are dominated by the strategic power represented by maritime movements, with the later, successive stages of approach, as through Charlemagne’s development of an inland waterways system of combined rivers and connecting canals; then, proceed from that to the role of railways as supplements to riparian-canal systems, thence to trans-continental railways which represent a powerful, “geopolitical” challenge to imperial maritime capabilities. The latter is the great issue which prompted the British Empire to drown the planet in a permanent state of global warfare from the time of the 1890 British ouster of Germany’s Chancellor Bismarck through the ensuing state of virtually perpetual warfare throughout this planet since that time. From there, move on to the fact, that since “World War II,” we have had the prospect of a great change in the economy of life on this planet represented by the then-recent mastery of the domain of nuclear fission. We are now, for example, advancing toward general application of the higher cultural-physical phase of thermonuclear fusion, and beyond. To bring about a relevant, competent understanding of the functional implications of such relatively primary kinds of logistical factors in government of mankind’s habitation of our planet, we must take into account the broader and deeper implications of the concept of the “oligarchical principle” in shaping mankind’s shaping of mankind’s history. I shall classify this aspect of the problem by using the term “monkey business:” the role of cultures in which some people treat other people as, at best, virtually higher apes, rather than the human beings which they actually are. Thus, there is the related issue of a functionally essential, strategic correlation, between the permission of some people to permit other people to use the higher forms of the principle of “fire,” and the oligarchical model, in which latter case, a ruling class treats the lower classes of persons as virtually apes, denied the effective, willful choice of use of power, as such suppression of the conditions of life of the so-called “lower classes,” is done in the name of “environmentalism” by the British monarchy and kindred nasty types today. To summarize what I have reported in this present chapter of the report this far, that which I have chosen in order to arrive at an appropriate method of policy-shaping for a national economy, or a portion of technologically and culturally similar nations in the world economy, we must distinguish between the general “foundations” of the economy of a nation or related group of nations (what I have termed “the platforms”), and the way in which that foundation is utilized for the development of the local and regional applications of particular methods and capabilities of production represented by local production, services, and individual public and private enterprises. To summarize this chapter’s introductory remarks thus far, let us emphasize the level of scientific and cultural development of, on the one side, the foundations of the productive potential of a nation and its regions, and, on the other, the application of scientific and technological potential to planting and harvesting the fruits which depend upon the qualitative level of the general foundations on which the fruitfulness of the production throughout that region depends. I think it preferable that I interrupt the line of the argument which I have been following within this chapter thus far, to bring into play the notion of a true universal physical principle, a notion which does not exist in the practice of either the crude “materialists,” or either the Aristoteleans, nor the followers of the doctrine of “pleasure-pain” of such as Paolo Sarpi and the notoriously degraded Adam Smith. So far in this present chapter, I have emphasized the use of fair descriptions, as if to “box in” principled conceptions, rather than address them more directly. Now, I must shift to direct representation. In reality, there is no “space per se.” There is no separation of “space” and “time,” but, rather, there is an indivisibility of a space-time best fairly identified as “a space-time filled with cosmic radiation,” a system of cosmic radiation which situates the “singularities” which a less sophisticated science prefers to identify as “particles” or the like. Recent investigations bearing on the role of cosmic radiation “permeating what is never, and nowhere a part of ‘empty space,’ now depend on deeper insight into the conclusive quality and forward-looking implications of the apparent qualitative divisions, and interrelations among the Lithosphere, Biosphere, and Noösphere,” within our galaxy. 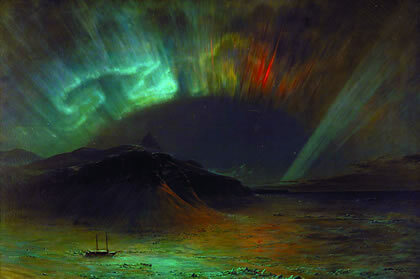 Shown: “Aurora Borealis,” by Frederic Edwin Church, 1865. That principled type of distinction has broad implications, but, here, I concentrate attention on one aspect. The domain of the “cosmic radiation” of “space-time,” can not be understood efficiently except for those cases in which the subject of primary interest is something which does not exist for either the followers of Aristotle or modern Sarpian Liberalism, to say little about the crudest form of sense-certainty. Since some of these implications pertaining to cosmic radiation are currently being addressed by a core grouping among my associates, I shall limit myself here to minimal considerations on this subject. Expressed most simply, while avoiding actual error, the situation to be referenced here, is presented as follows. No truly universal principle of nature can be deduced, in itself, as a derivative of a mathematical deduction. The most useful illustration of that point is the case of Albert Einstein’s recognition of Johannes Kep­ler’s uniquely original discovery of the principle of universal gravitation, as implying a universe which is finite, but not bounded. The proof of Einstein’s conclusion on this account, is illustrated immediately by the method which Kepler employed to define a universal principle of gravitation, especially when one takes into account Kepler’s method of experimental hypothesis for de­­fining the principle of the Earth orbit. The construction of the duplication of the cube by Archytas, is an illustration of the case of a physical action which can not be represented deductively, but for which there is a construction. This same principle is expressed systematically in the work of Bernhard Riemann, and, notably, the discoveries of the principles of the Biosphere and Noösphere by V.I. Vernadsky. Indeed, contrary to the hoax of Titius-Bode, every true discovery of a valid universal principle is literally metaphorical in the respect that its proof is not located within the domain of an extended notion of sense-perception. Whereas, the universe is inherently creative, the creativity is not willfully generated in the way human creativity functions; it is the willful aspect of human creativity which distinguishes V.I. Vernadsky’s Noösphere from the Biosphere. The role of the human intellect and its will in efficiently discovering successively higher orders of true creativity in the universe, is the essential distinction of man from beast. Mankind creates, and that willfully, specific types of higher states of organization in the universe than would be generated by other means. It is by such human activity, whether by some original inventor of the discovered principle, or by assimilating some broader implication of an already discovered such principle, that the essential changes of the human race to higher qualities of states of existence within the universe are accomplished in a willful mode. The occurrence of such forms of human individual’s such creativity has the characteristic of a change in the lawful ordering of the universe by the action of the human creative will. Man introduces a new state of lawfulness into the body of the universe, man, seen in Biblical terms of Genesis 1, as representative of man and woman “in the likeness of the creator,” not in form, but in function. Consider the most crucial of the relevant developments of trans-Atlantic civilization during the period of accelerating emergence of a new kind of society which appeared at an accelerating rate throughout the early through middle decades of Europe’s Fifteenth Century. Focus on the process leading into and beyond the mid-century’s Florentine Renaissance—the so-called “Golden Renaissance,” and its expression as “the great ecumenical Council of Florence,” a renaissance whose intellectual leadership featured, to most notable scientific and economic effect, the leading role of the figure soon to become known as Cardinal Nicholas of Cusa. 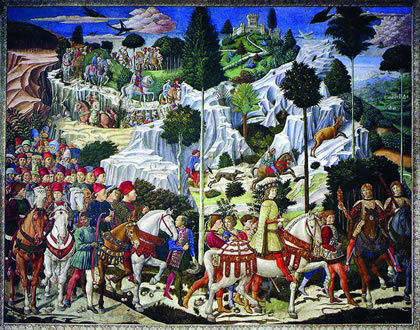 The 15th-Century “Golden Renaissance” revived European civilization following the 14th-Century “New Dark Age.” Shown: “The Journey of the Magi,” by Benozzo Gozzoli, 1459-61, a metaphor for the visit by leading scholars, statesmen, and intellectuals, to the Council of Florence (1439). Divide the entire period into three principal parts, beginning since the earlier collapse of Fourteenth-century Europe into a so-called “New Dark Age,” the process of a relevant discovery of civilization in Fifteenth Century Europe under the impact of the process culminating in the Florentine “Golden Renaissance,” and the later descent into the 1492-1648 period of horrid religious warfare. To gain access to the “flavor” of the Fifteenth-century Renaissance itself, consider, in broad terms, situating that review among the crucial features of the developments in Europe during the Twelfth through Fourteenth centuries. The close of the Tenth Century had seen the beginnings of a long wave of decline of the second phase of the Roman Empire, the Byzantine empire, and the rise of Venice as the center of the leading, imperial form of monetary power in Europe generally. The character of the opening of this period, is identified by the rising role of Venice as the monetarist power of Europe, and the expression of that character of the period by the Norman Conquest of the British Isles and the process of the Crusades, leading into the mass-murderous “New Dark Age” of the Fourteenth Century. That Fourteenth-century “New Dark Age,” is to be remembered, since the so-called “Norman Conquest,” as the period of the notorious Hildebrand, a period dominated by evil Crusades, such as the Norman Conquest itself, warfare launched under rising Venetian monetarist financing and manipulations. It was a period which, from the time of the Norman Conquest into the depths of the Fourteenth-century “New Dark Age,” a period of broadly chaotic, genocidal nightmares, leading into that vastly and stubbornly genocidal nightmare, a horror which began to end only with the cleansing of a Christian church deeply corrupted by its Venetian direction, until the rising contrary developments, known as the Renaissance, during the early through middle of the Fifteenth Century. Return to touch on some matters to which I have referred earlier in this chapter. The modern expression of this notion of actual, universal physical principles was introduced to the “post-dark-age” developments in Fifteenth-century Europe around the rallying point of what I have already identified here as the great ecumenical Council of Florence. Many from that time contributed to this, including, notably, the Jeanne d’Arc whose specific intention and heroism inspired the great Councils of the Christian Church through the middle of that century. The most fertile of those minds engaged in launching the Fifteenth-century Florentine-centered European Renaissance, was what I have already referenced as the great “polymath” of the period, Cardinal Nicholas of Cusa. 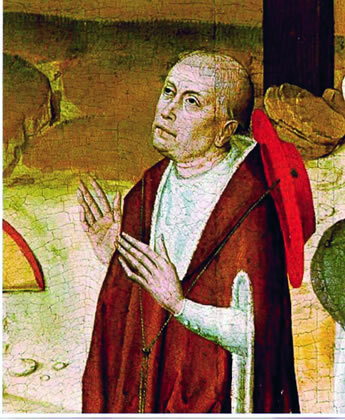 Nicholas of Cusa, the great “polymath” behind the ecumenical Council of Florence, is the founder of modern science. There were two outstanding historical figures of the period leading into the Great Ecumenical Council of Florence, Jeanne d’Arc, who was baked alive by the English (Norman) inquisition, but whose role and its reflexes on Europe not only bestirred the councils of the Christian church during that time, but which had a crucial effect in shaping the history of Europe from that time on, through the great role of France’s King Louis XI. This was the same Louis XI whose role inspired the revolution in England led by Henry VII. These developments, sparked in significant degree by Cusa’s Concordantia Catholica defining the modern sovereign nation-state, and Cusa’s formal founding of modern physical science, his De Docta Ignorantia, remain outstanding, still throughout the world today, as the root of the launching of all competent strains of modern physical science today. For example, it was Christopher Columbus’ reading of the legacy of Nicholas of Cusa, in Cusa’s proposal to build up civilization by trans-oceanic voyages to distant continents, which prompted Columbus and others to cross the Atlantic, as a measure to save European civilization from the effects of a fresh Venetian launching of a European dark age of wars and the like. It was Cusa’s initiatives in the founding of modern science which were chiefly responsible for every great scientific figure of Europe from the late Fifteenth, Sixteenth, and Seventeenth centuries, with strong reverberations among all competent currents of fundamental scientific progress. Such as Bernhard Riemann, Max Planck, and Albert Einstein, to this day. As the case of Cusa exemplifies this, all great movements in physical science were essentially “polymathic,” as for the great, avowed follower of Johannes Kepler, Gottfried Leibniz, for whom there was never any separation of the world-outlooks of Classical artistic composition and physical science. Thus, the mid-Fifteenth-century great ecumenical Council of Florence, was that true Renaissance of European civilization on which all of the good developments in European civilization have depended for their adopted roots, to the present day. It was not the entry into Paradise; it was an entirely original quality of advance in mankind’s insight into mankind, which emerged to remain, thus far, an imperilled new force of civilization on which the creation and usually imperiled existence of our United States has depended up through the presently, monstrously imperiled United States of America today. Many from that period of the Renaissance contributed significantly to this greatest of all known qualitative achievements of mankind to the present day, including the rise of the Federal Republic of the United States out of the seedlings planted in Massachusetts during the middle of the Seventeenth Century. That subject, so situated as I have done immediately above, is the kernel of the argument which I present here and now. In this present report, up to this present point in my account, I have emphasized the physical accomplishments which supplied the foundations of all European society since the appearance of the roots of the influence of Solon of Athens. Now, bearing in mind my preceding remarks, we are obliged to shift our point of view in a qualitative way. By “culture,” I now signify the transformation of the physical quality of the existence of our human species on which the physical fate of human life on this planet absolutely depends; I mean to emphasize the role of the cultural impact of the Fifteenth-century, Florentine-centered “Renaissance” in producing what became the Seventeenth-century high point of the Massachusetts Bay Colony under the leadership of the Winthrops and Mathers, and of what survived of the great Massachusetts Renaissance in trans-Atlantic civilization, to become the heritage of the Eighteenth Century’s Benjamin Franklin, that heritage of our United States, which is expressed by the American Revolution and by the launching of the constitutional, anti-monetarist credit-system which is to be recognized as the United States. So, turn to the second of the two approaches which I have outlined for this chapter of the report. Take the model historical case of the original foundation and development of the Massachusetts Bay Colony prior to both the last period of suppression of the colony’s development, a period of peril during the reign of England’s James II, and the crushing of the colony following the accession of that “New Venetian Party” which was led into power in the British Isles by William of Orange. To understand the roots of our American Revolution, we must take into account, and emphasize, what is presently the almost unknown concept of what is truly a universal physical principle. This is a notion of principle which does not exist in the imagination of such as the followers of the ancient Aristotle or the modern Paolo Sarpi, the true notion of a discoverable, universal physical principle. In notable degree, that Renaissance in science and the principles of humanism, was brought into modern European culture as an echo of the process leading into the great achievements of Plato and his associate, that Pythagorean, Archytas of Tarentum, whose signal achievement had been, what the later Eratosthenes underscored as the method of construction required for the duplication of the cube. “The great obstacle to human reason has been the popular delusion of belief in ‘sense-certainty,’ ” LaRouche writes. 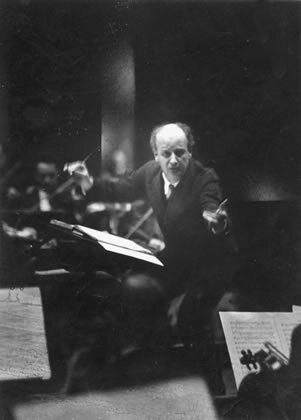 As the great conductor Wilhelm Furtwängler warned, “music requires its performance ‘between the notes.’ ” Shown: Furtwängler, conducting, in the 1930s. What we can properly claim that we know, is the discovery of universal principles, as Archytas crafted the duplication of the cube, and as Johannes Kepler defined, uniquely, and with perfect originality, the principle of universal gravitation. Consider the great lesson provided by Classical poetry, uttered accordingly. The function of the great principle of metaphor, as in Classical poetry, and as in musical counterpoint composed and performed according to the principle of Johann Sebastian Bach, is to provide mankind with a prescience of the approach of a discovery of a great principle. We call this “Classical artistic” composition, because it is presented to us as if a voice of truth spoken from the future, not yet the present. It is the shadow cast by a principle of the universe which is yet to be spoken; thus, properly uttered, or performed as music, it is the idea which can never be deduced, since it is the prescience of that reality which is still waiting impatiently to become discovered. Those who do not serve that principle, should—please—never compose Classical poetry or music. All competent practice of scientific discovery depends upon exactly that same principle of the prescience of a hand from the future reaching in to touch one’s soul with a discovered principle of nature yet to be born. The true mission of the human individual is to feel the prescience of the principle which is about to be born. Such is the true content of the much-abused word named for a prescience of immortality, a prescience which you might wish to call “love” of being, in that moment, truly human. 1. The Accumulation of Capital, Chapter 30, “International Loans,” 1913. 2. Europe The World’s Banker 1870-1914 (New Haven: Yale University Press, 1930). 3. There are professional economists whose work I applaud on many accounts, but my own successes as a forecaster, since the 1950s, are unrivaled, while my skills as a physical economist have been, on the record so far, unique. 4. Not the silly Titius-Bode concoction of the reductionists’ schools. As learned and mature as LaRouche is, one would think his writing ability has had plenty of time to improve. Apparently not. Seems to have done the reverse. No kidding. He’s apparently broken his own world record here (formerly held by Karl Marx) for # of *unsupported assertions* in one essay. What a supercilious waste of time. He knows what he knows so at 95 years of age is he going to communicate better or worse? Do his listeners hear better or worse? I think there has been a great awakening and we are seeing now what LaRouche has been seeing since WWII. People from California to Virginia to New York ask LaRouche organizers such as Harley Schlanger on SGT Report to explain the Q phenomena. Former intelligence members are out and about in the take down of the swamp critters. George Webb walk the streets of D.C. today connecting the dots. William Binney tells of dossier chicanery. Mike McKibbens, CEO of Leader Technologies lays out the results of his intelligence gathering. You know we have more than a printing press that Martin Luther had; we have the www to win not just a reformation but a new renaissance. OBOR is working to leapfrog sh*tholes into the 21st century with transcontinental rail and water resource management (Transaqua, NAWAPA), nuclear fission energy platform, etc. We will make mistakes taking over from Mother Nature to terraform our blue planet but we will be united in a global community of sovereign nation-states. Whew! He’s writing about St. Paul’s words…that we fight not flesh and blood but powers and principalities. He is into meta physics, not spirituality. When talks about “fire” he tap dances around God very deftly. For a truly beautiful experience find Furtwangler’s lovely recording of Beethoven’s 6th Symphony…the Pastoral. You will walk on air like young lovers the rest of the day. Does this shed light on why he was persecuted after the war, even though he kept his many Jewish musicians and their families safe for the duration? Many have wondered at the dirty threads behind that, including Yehudi Menuhin and others, What a world!!! Please note that the following are an Asian Observations, not personal comments. 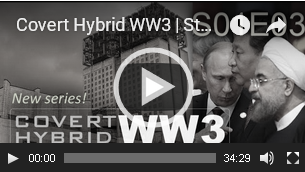 When one look at World History, the usual is look at WESTERN History & CIVILIZATION. It usually start with Greece, to ROME, and ending up with North America. This part of History is less than one third of the WORLD HISTORY covering less than 5,000 years. Egypt was included in the WESTERN History as Egypt was mentioned as part of the WESTERN Religious records. The Rest of the WORLD HISTORY has recorded history well passed 8,000 years. Western Exploration or Expansion, starting with Alexander, into the EAST was not chasing Dragons & Myths. It was a desperate need to find ALTERNATE ROUTES to the Land of Spices, Silk & Technology. To find a new route to CATHAY, circumventing Venice & the ARABS along the SILK ROAD. May I suggest we look at the Important Timelines. The Invention & Technology Timelines, the TRADE Timelines, the SOCIAL DEVELOPMENT Timelines and the RELIGIOUS Timelines with an exception, Buddhism and Confucianism are NOT Religions but a way of life. The WEST has raped the East. The eight Nations secured the financial & technological resources to start their industrial revolution after ransacking the richest city in the world at that time for 100 days. Is that the reason the PRC has started to rebuild the SILK ROAD by land and sea. If the whole point of this was simply about the ..
British / Roman empire ..
Well then, try this ..
For “special effect” required ..
Then pick up a copy of “Rulers of Evil” by F. Tupper Saussy ..
You will be way ahead of the game upon completion ..
…but that would get in the way of their (LaRouchie’s) goal of deliberately wasting our time. You guys should know by now, everyone hates LaRouchies for a reason.